As you may know I write a monthly roundup of great homes and interior posts for the Britmums blog. This month many of the posts I’d been reading focused on great ways and ideas for doing up your home on a budget and it got me thinking about how much we spend on our homes. Some friends are having to install a new boiler too and we have been debating the best way to go about it to save on the finances. So how can we save our pennies when we need to make major changes to our homes? Many of us have a complete block when it comes to DIY. It can be very daunting and for lots of us, completely out of our comfort zone. But this is the main area where we can save money. If you feel that you can teach yourself, or indeed go on a course to learn a new DIY skill this is a great way to do your own jobs around the house. And you never know you may end up earning some extra money by doing these jobs for your friends and acquaintances. Take plastering for example, my Dad has been an expert plasterer since he was young and has passed that skill on to …. my husband! So now we have two plasterers in the family and it saves us lots of money. There are lots of great magazines out there too, which will teach you a new DIY skill so why not give one a go. If you’re on a budget you really can’t afford to spend the majority of your money on labour. As we’ve mentioned before, don’t forget to shop around and get several quotes for the work you need doing. Don’t accept the first one, and do get references too. Using something like UK Tradesmen Listings when you’re hunting for a tradesperson is a great idea as they often contain reviews from local clients. We are lucky enough to belong to a local Skills Exchange and if you have one in your area they are well worth joining. Born out of the idea that small communities should try to be self sufficient to save the environment we list our skills in a group database and call on each other when we need those skills. Your time is ‘paid’ for in gems (1 hour per gem) which then allows you to buy in the skills you need. We’ve used the plumber, the quantity surveyor and the flower arranger in the last year saving us a small fortune. My husband is doing a roaring trade with his IT skills so the gem pot is looking quite healthy at the moment. Even if you don’t have an organised Skills Exchange in your area why not get together with a group of friends and pool your skills. I am sure you will find people with skills that you need and vice versa. Don’t ever think you don’t have any useful skills, most home owners love someone to come in and tidyup or clean, even if you can’t mend the boiler or rewire a plug. If you don’t have the tools for the job, think about hiring them for the day or the weekend. It’s a much cheaper option than buying them in most cases. Or maybe you know a few friends that are into DIY and could loan you the tool. Maybe they would even pop round and help you out with the job! If hiring isn’t for you, think about asking for the tools as a birthday or Christmas gift. Not always exciting but necessary when you’re on a budget. What do you think? 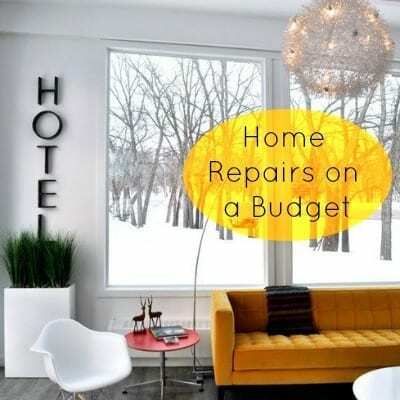 Do you have any great ideas for saving money when it comes to big DIY jobs. Something I’ve learned while shopping around for contractors is to not believe their estimates. They are almost always off on time and on materials. Historically, I have liked to pay contractors on a time and material basis because I thought it was cheaper because they don’t add any fluff to their costs like they can in a firm bid. As an example of what can happen my contractor just installed a new front door for me. His estimate was $400 but because he ordered the wrong size front door (and mills don’t take returns) he had to reconfigure the opening of my house, do extra drywall work, use extra materials, and because the opening was different, the exterior trim no longer fit and I had to buy new trim and rework the vinyl siding. My point is that you should know what is a reasonable amount of time to complete the project and then make sure that they only get paid for that amount.